HomeWhat about that new Special Information Booklet …..the “Toolkit” ….. when do I have to provide? What about that new Special Information Booklet …..the “Toolkit” ….. when do I have to provide? For many years we have been providing booklets at application and at closing, but the process has escalated to a very serious issue when you are audited. It used to be called the Settlement Costs Booklet. Now it is called the Toolkit. Do you provide the booklet as required? The booklet must be delivered or placed in the mail no later than three business days after the application is received. We are talking about a qualified application (the “six things test”). Delivered means handed to, or mailed in physical form in the US Mail, or UPS, or e-mail. E-mail? Sure, why not? If you e-mail and request a receipt, and send it to an e-mail you know to be valid, it should satisfy Electronic Documents rules. Lenders are required to deliver or mail the Toolkit not later than 3 days after receipt of an application. 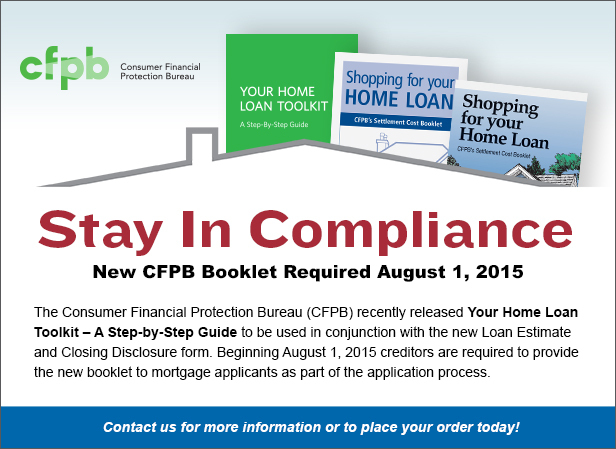 However, in the Federal Register notice announcing the Toolkit’s availability, the CFPB encourages all market participants (such as realtors) “to provide the [Toolkit] to consumers at any other time, preferably as early in the home or mortgage shopping process as possible.” The Toolkit is designed to be distributed electronically and has interactive worksheets and checklists. So that should end any argument that it had to go in the US Mail, huh. Just be sure you can prove you sent it. It is not considered delivered if all you do is make it available on your website. You have to go a step further. By the calls and emails I am receiving, I am discovering that many of you are not ready for TRID yet. If you are not my client, call me at (800) 656-4584 and let’s see what we can do about your compliance program. Here is a link to the actual Toolkit. Take a look, today.